The government’s decision to follow one of the recommendations from the Australian Law Reform Commissioner’s report and adopt a national plan for elder abuse has been welcomed by a legal body. National Legal Aid (NLA) said it welcomes the national plan to fund the study into the prevalence of elder abuse, announced by federal Attorney-General Christian Porter and the Council of Attorneys-General yesterday. NLA chairman Dr Graham Hill said the national plan comes at a time where increased government funding is urgently needed to provide legal aid for the growing numbers of elder abuse victims. “This study will show that growing numbers of socially disconnected elderly Australians are being financially abused by family members, carers and scammers,” said Mr Hill. In particular, greater assistance is needed for victims dealing with crippling civil law disputes relating to their savings, property and access to grandchildren, according to Mr Hill. “Civil law elder abuse matters often relate to money, property or access to grandchildren,” he said. “Increased government spending is essential to ensure these vulnerable victims have a lawyer in their corner when faced with these disputes. Ultimately Mr Hill described Australia as being “one of the lower-funding nations when it comes to per capita spending on legal assistance services”. “The UK, for example, provides significantly higher levels of funding for legal aid and this ensures there is greater assistance in civil law matters,” he explained. Mr Hill added that the nation’s civil law assistance is about to get a whole lot worse because of its ageing population. “Our nation is on a chronological conveyor belt: every year, more and more people move from the over-60 age group into the over-80 group. As those numbers increase, so too will the incidence of elder abuse,” he said. “That incidence must be met with a corresponding increase in the legal assistance we provide to the victims of that abuse. “Now is not the time to look away. This problem is hurtling towards us like a train. 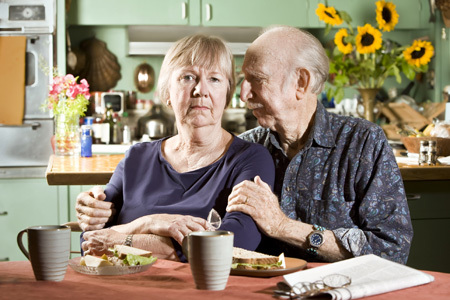 In any given year, about 4 to 5 per cent of people over 65 will suffer an incident of elder abuse. As the number of over-65s increases, so too will the incidence of elder abuse and the need for those victims to receive legal assistance. SMSF Association chief executive John Maroney said elder abuse was also a key concern for the SMSF Association with 47 per cent of SMSF members aged 60 or older. “Elder abuse is an emerging risk for the SMSF sector and the ALRC’s recommendations regarding superannuation and the issue of enduring powers of attorney (EPOAs) can help mitigate it without significantly increasing compliance for SMSF trustees or limiting choice on how to run their fund,” said Mr Maroney. Mr Maroney said the Association also supports the recommendation to provide replaceable rules for the limited circumstances where an SMSF trust deed does not appropriately allow a new trustee to be added to a fund where an EPOA is required to be used. “Similarly, we support the ALRC’s call for a review of the laws regarding binding death benefit nominations for superannuation fund members. We acknowledge this is an area of superannuation law where there is increasing disputation between a deceased’s beneficiaries and relatives,” he said.